In the same way that preachers always preach not only to the congregation each week, but also to themselves, I am currently leading two Forty Days of Prayer groups, and the lessons we are learning and practicing are renewing and reviving all of our spiritual lives, including mine. I've heard from so many people how very life-giving the study is so far. Each day, we are asked to reflect deeply on one Scripture passage, write down what God is saying to us, and then to turn our thoughts into prayer. One of the passages this past week was Philippians 4 (above). As I reflected on what God was saying to me, I thought of both the low-level and high-level anxiety we all live with for the simple reason that, deep down inside, there is a fear we all share. Sometimes it's on the back burner, other times it's like a neon light flashing before us. It's the reality that, despite our best distractions, we often have very little control over the "big" things in life - those circumstances that really throw us. Like a sudden serious illness, the loss of a job, a loved one walking out on us, a sudden financial collapse, the death of a loved one, our OWN impending death. 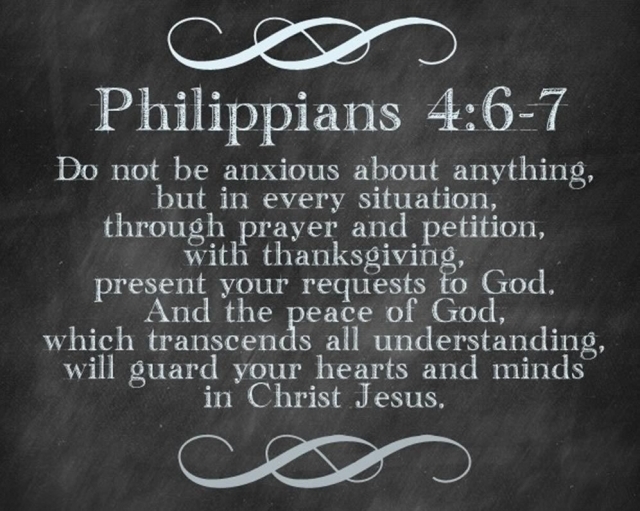 But God's Word makes an amazing statement: there is no reason to be anxious. God is greater than any calamity that could possibly happen to us. So if we will just be bold enough to skip the usual fretting and worrying, but instead immediately go to God in supplication and thanksgiving, that peace of mind that we want and need so badly is God's gift to us. And I know from experience how true that is! It's happened for me over and over. Once I managed to calm myself enough to just sit quietly in God's presence, the result has ALWAYS been a peaceful kind of clarity that helps me not only know my next steps, but also gives me the assurance that whatever happens, everything will still be alright. The secret is to develop that mindset of immediately sitting in God's presence BEFORE doing what comes so naturally - engaging in worry and anxiety. So that was my prayer focus for Day 3. Close to 40 of us are on this 6-week journey of learning to communicate with God as a small group. We're focusing on speaking and listening to God more effectively. What we know is that amazing things really DO happen when people start to truly pray passionately from their heart. I hope you'll continue to join us on Sunday mornings for "40 Days of Prayer" sermons. And I hope you'll take some time to reflect on God's Word each day and then turn your reflection into prayer.